I remember learning to stitch various embroidery stitches on gingham fabric when I was four and sewing lots of embroidered felt projects from a little Ladybird book in the years after that. My mom used to do a lot of dressmaking and I remember going to sleep to the sound of her machine so sewing in one form or another has always been part of my life. My first counted cross stitch project was a Pierrot kit I was given one Christmas, I think I was nine or ten? 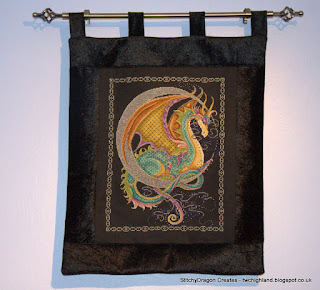 In my teens and early twenties I sewed clothes, toys, and home furnishings, and gradually started cross stitching more as my children started school. Although cross stitch will always be my first crafty love I gave in to the call of the fabric and started learning to quilt in 2010. 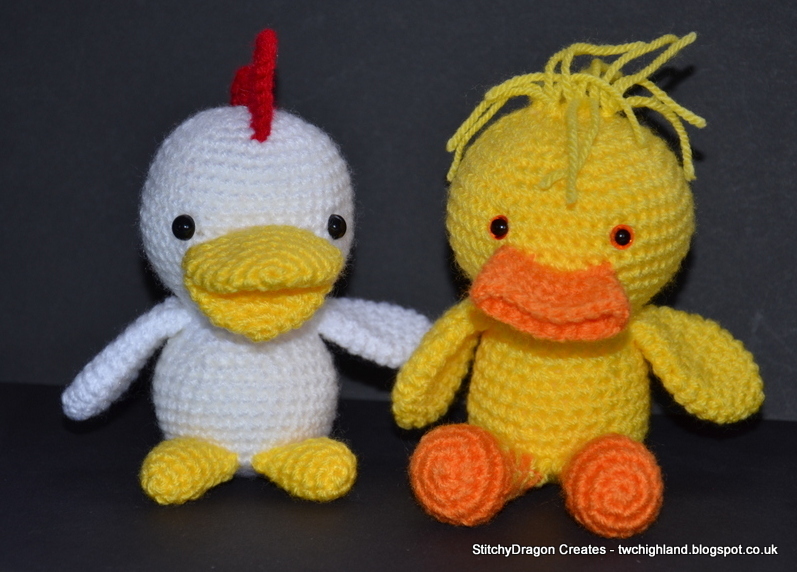 The following year I started crocheting, first amigurumis and then exploring the wider world of crochet. In 2013 I picked up knitting needles for the first time in almost thirty years and have found much truth in that saying “In the rhythm of the needles there is music for the soul”. 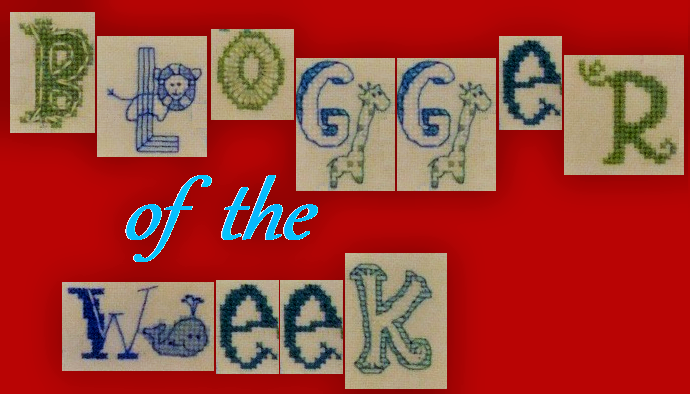 I started blogging in February 2012 mainly due to the encouragement of a bloggy friend. I had been following a few crafty blogs (including hers) for a little while and thought that, even if no one else was interested, it would be an easier way to keep my far flung family updated with what I was up to (90% of my family are spread across North America). Dragons have been my favorite animal since early childhood and StitchyDragon was my original user name on the first online forum I joined so StitchyDragon Creates seemed a natural blog title for me. 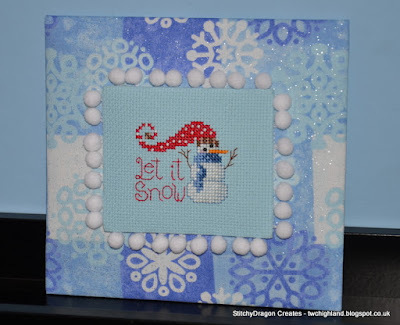 I used to be a strictly OOAT cross stitcher but once I started taking on bigger projects and then added in different crafts that went out the window! 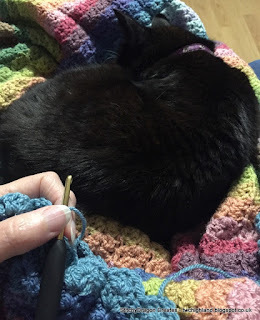 Now I try to keep it to two cross stitch projects on the go (usually a big and a little), and no more than two knitting projects, one quilty project, and a crochet blanket on the go at a time. With the emphasis on “try” ��…I also have some UFO’s and the last two years I have been focussing on finishing these off (and not adding new ones!). 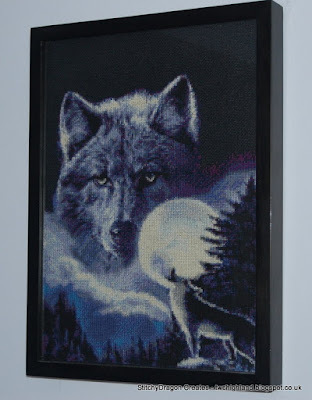 I like a wide range of styles but my favorite cross stitch designer would have to be Joan Elliott. Apart from designs she has had in various magazines over the years I have five of her books to work my way through! I’m definitely more of a traditional quilter, I love civil war fabrics, applique, and anything with a star block will grab my attention! Knitting wise I love stranded colorwork and socks (don’t ask how much sock yarn is upstairs waiting to become actual socks! ), and crochet wise my biggest inspiration is Lucy of Attic24. I have been lucky with my stitching so far but my knitting adventure started out with a disaster. 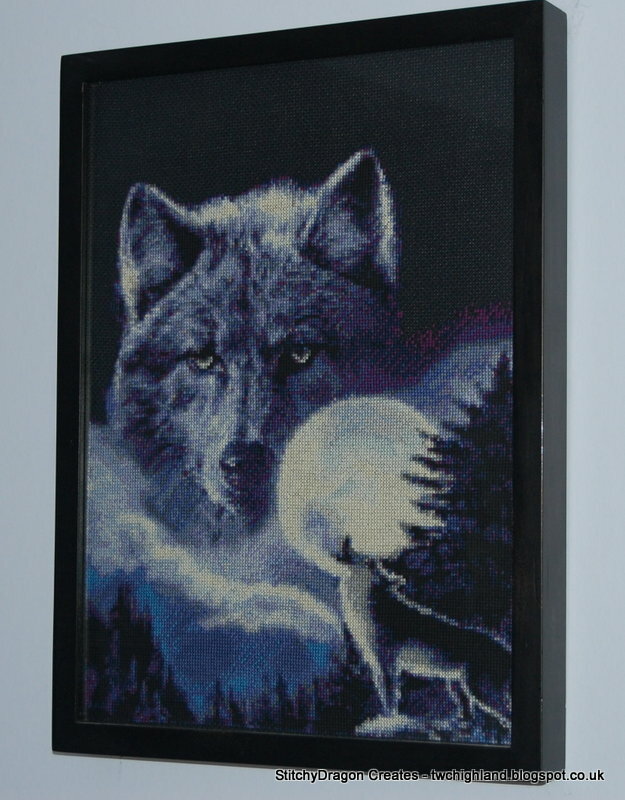 My Nan was an avid knitter, she taught me to knit as a little girl and was always on hand to help me. Three years after she passed away I decided to knit myself a fair isle cardigan as my first knitting project in almost 30 years (I mean how hard could that be?!) so after 7 months (and a steep learning curve!) it was finished. I wore it a couple times then washed it and it stretched to where the arms would’ve fit a gorilla! I tried washing it in slightly warmer water and - yup you guessed it! 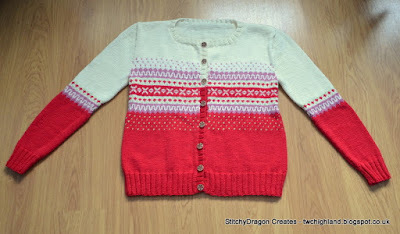 – it ended up a felted shrunken mess! It is the only project (to date) that has ended up in the bin as unsalvageable. I taught my kids to stitch when they were little and I have the first project each of my sons’ finished along with two of my own first cross stitch projects in a drawer upstairs, likely they won’t be fully finished into anything now. My daughter still stitches sometimes and I have two of her more recent finishes waiting to be FFO’d at some point when she is home and we will do that together. Everything else I FFO as I go along now. I have learnt so many different techniques thanks to the generosity of lovely folks on the internet but my current favorite way to finish a small cross stitch piece is as a flat finish. I have a seasonal shelf to display different smalls every month and the rest of the year I find they store better as a flat finish than as a wee pillow. OK... I choked on a carrot this afternoon and all I could think was "I bet a donut wouldn’t have done this to me!" I’d like to thank Jo for asking me to participate in this, I was really honoured she thought of my little blog! I don’t always get a lot of time in front of my computer due to health reasons but I do enjoy being part of the online crafty community and getting to know folks. Apart from all the temptation and enabling for new projects I find online an inspiring place to explore - there are so many amazing, creative, and talented, people out there! Wishing you all a happy and creative week. Wow you have made so many different beautiful things!I love Lucy of Attic24 too although I don't do crochet but I wish I did!AriadnefromGreece! 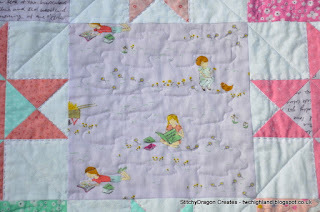 Lovely to read about your crafting Helen, you sound like a very busy stitcher and quilter! The quilt you made for your son is stunning, all the more so because you had to design it yourself. 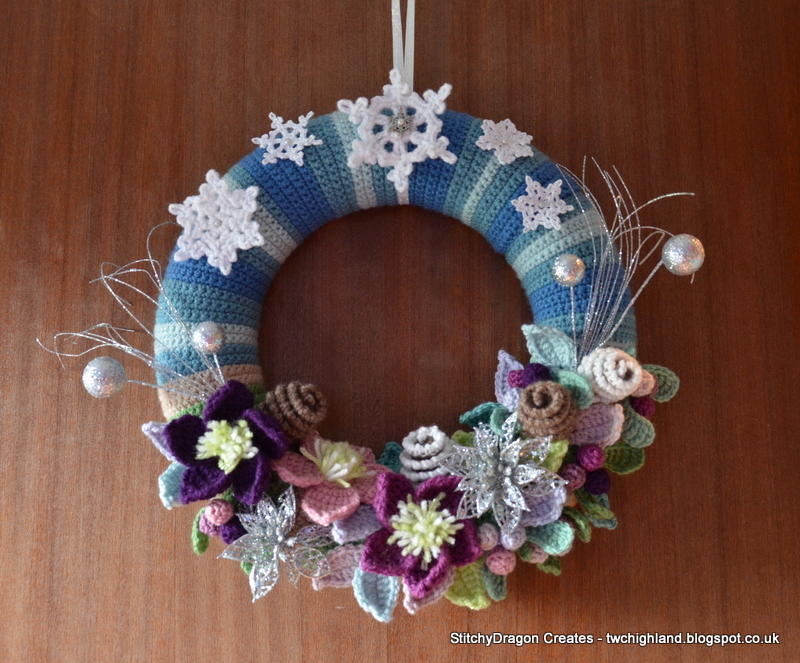 And I really really love your crochet wreath, the colours are beautiful. It was nice to meet you Helen. Your crafts are all lovely. I have enjoyed reading about your crafting Helen.You create a lot of different and lovely articles. It sounds as if you keep yourself very busy, Helen, with all your different crafts. 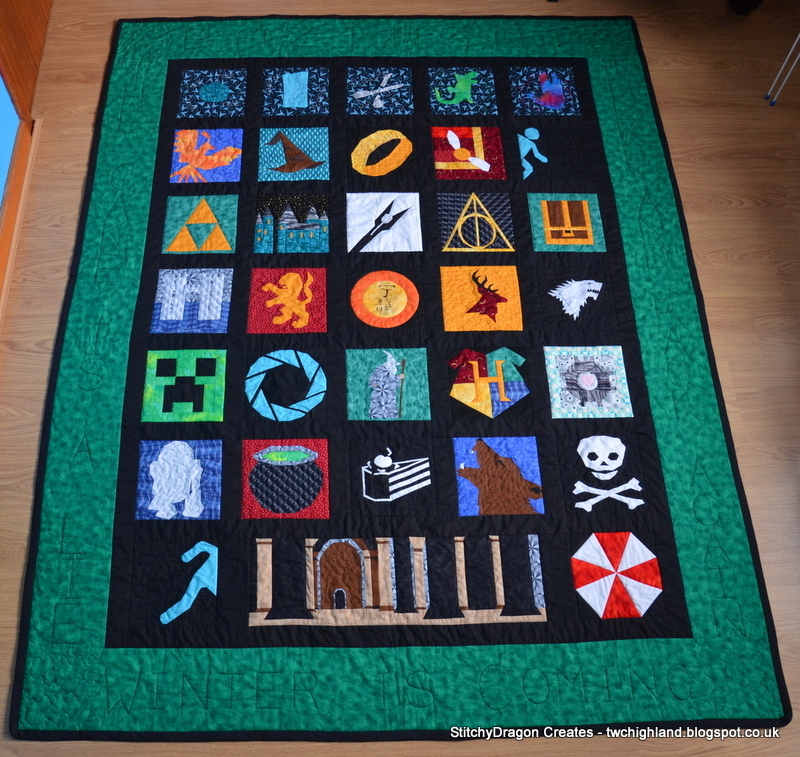 Your Geek quilt is impressive. Nice to meet you Helen. You have many beautiful pieces here! Great answers. Thanks for sharing. I'm a fellow dragon lover. 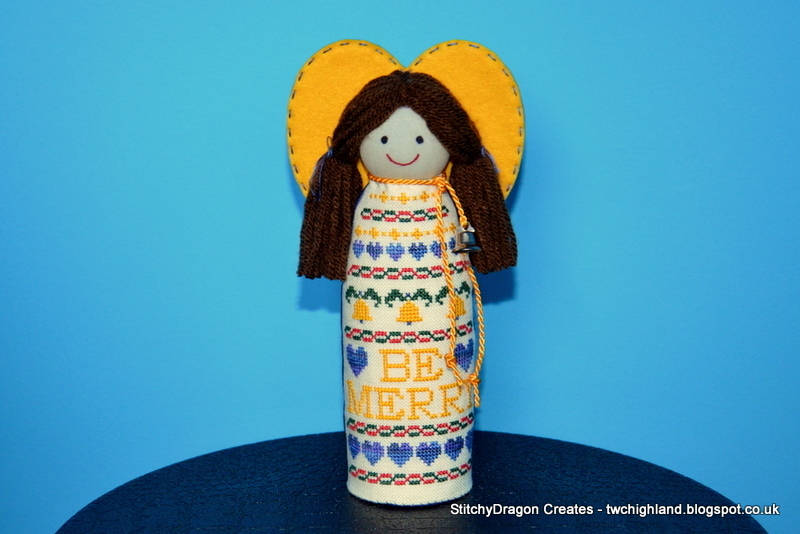 Hello Helen, so nice to meet a new to me crafter and to learn a lot about your creative crafty adventures. 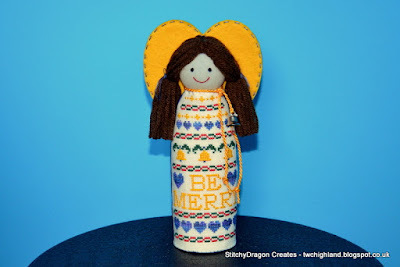 Is there a craft you have never tried? You show such wonderful pieces that go with your answers. Very impressive. 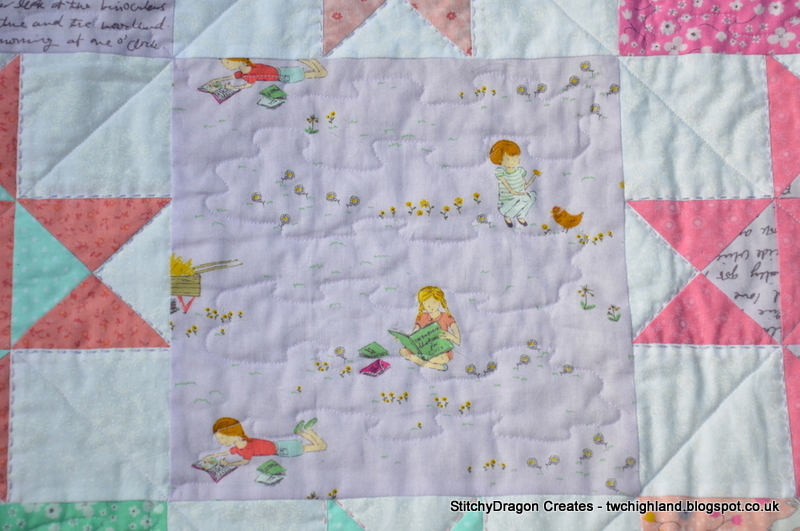 Love the Portal and HP blocks on your quilt! What a delightful piece of work that is! Your wreath is wonderful too. I keep telling myself to make a whole collection of them. I see you have Helper Kitties too. One of mine prefers to be an active participant -- she's great at tangling up yarn that was just quietly sitting there. Hello Helen, nice to meet you..... such a lot of fabulous projects you have shared here. Your cat is just like mine ... you have it, I want it! Helen, your Geek Quilt is wonderful; what a lucky son you have! It reminds me of a quilt my mom made for my brother ages ago, with Spider-man, Voltron, a truck, and so on.